So I have been horrible keeping up with the blog lately. I told myself that I shouldn’t post until I sat down to properly to put one together. Well that took forever – so I am currently typing with one hand, and holding Zara with the other. She has been a little sick the past few days so I’ve been chasing her around with fluids trying to keep her hydrated. She is getting better day by day. Can you believe its October?!?!? I sure can’t. October is a special month for me -because it is the month Zara was born! She will be one next week. I can’t believe how fast time flies and how much life can change in just one year! We’ve been planning her birthday bash – I will let you guys in on the the deets soon! On the style – It’s not my most glamourous outfit but it is one of my favorite! I wore this when I made a quick run the Mariano’s and had the hubs take a quick few shots. 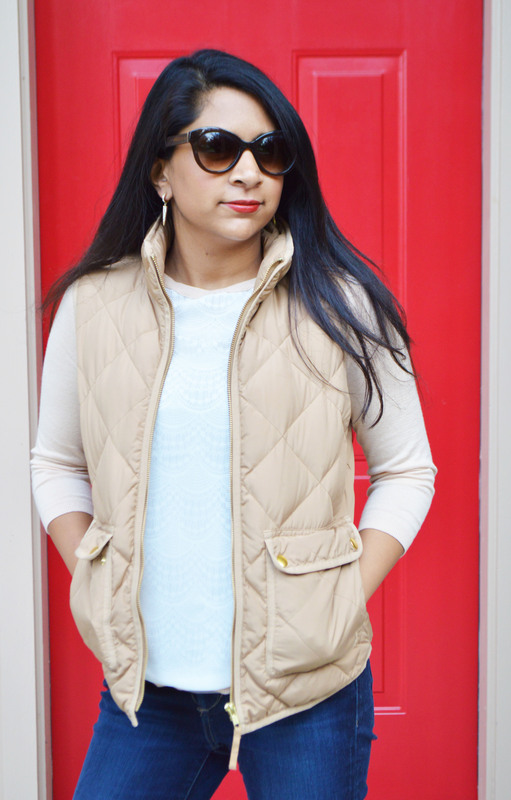 I love layering clothes – as you can tell from my last three posts – i’ve been vesting it up lately! Its probably just another reason why I love fall. 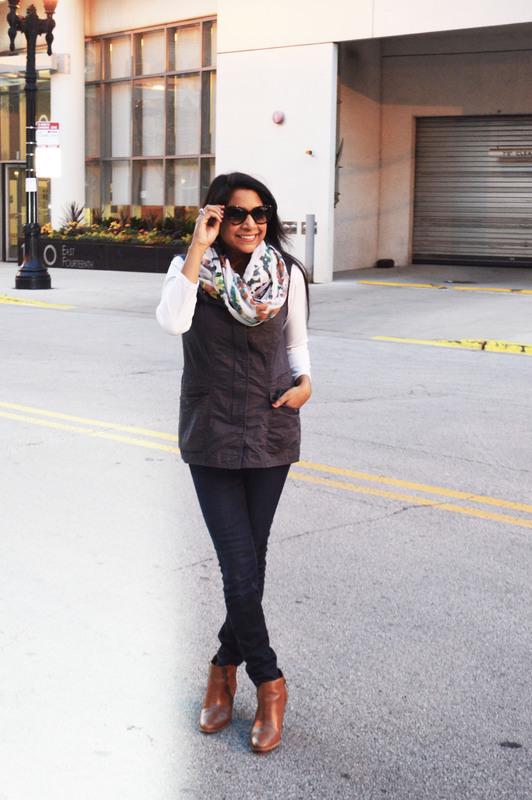 I found this military vest at the new Nordstrom Rack in Southloop and I fell in love with it. I paired it with a white tee, jeans and booties. 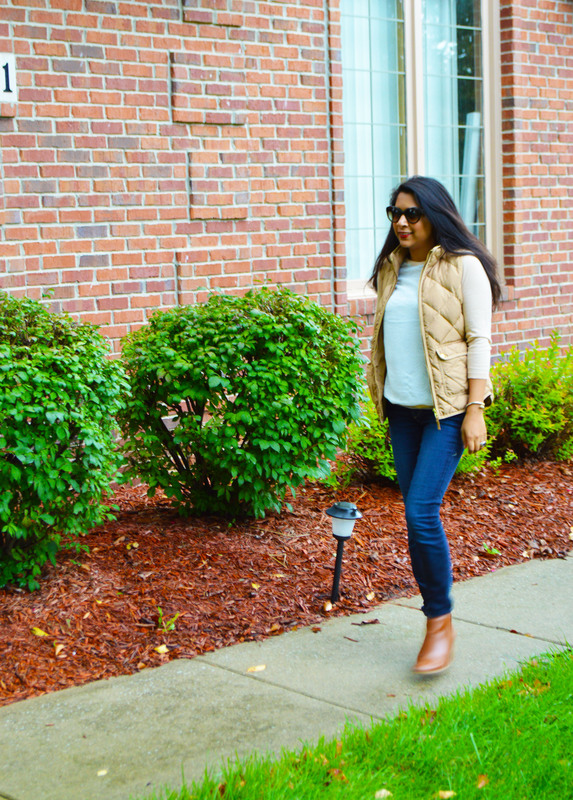 With the official start of fall – it is the perfect time to bring out my puffer vests! I currently have 3 in my closet – I’m likely to get more by the end of the season! 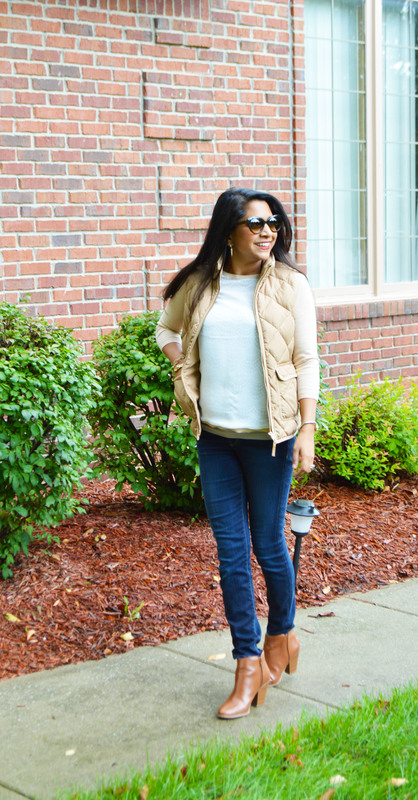 I find it is the perfect piece for layering – especially on those colder fall days. 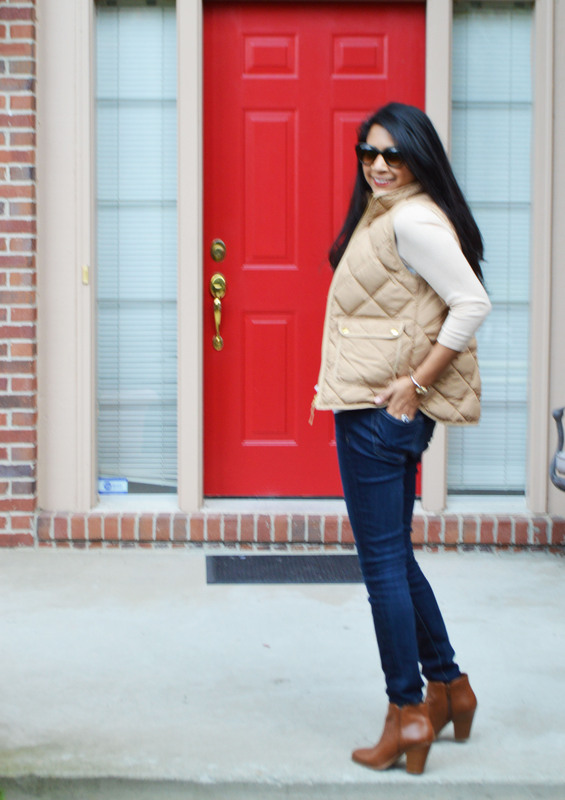 For this look I paired my favorite pair of skinny jeans, with a pretty pink lace front sweater from the limited, my saddle colored puffer vest from Jcrew, and tan booties. Even though the official start date of Fall is still 4 days away – its pretty safe to say – Fall is here! I love fall fashion! 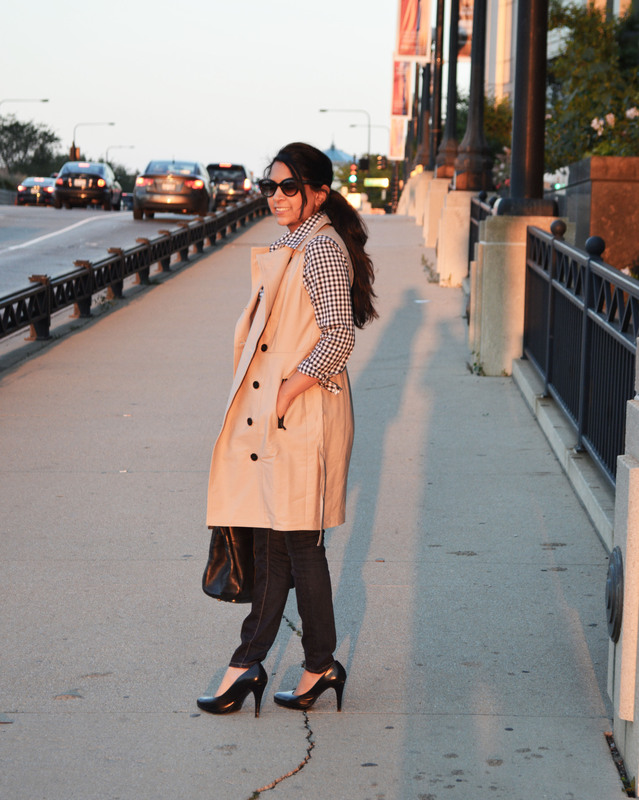 One of my new additions to my closet is my sleeveless trench! I know what your thinking – sleeveless seems out of place in cold weather, but this trench can really be worn year around! I love it because it looks great layered on top of a short or long sleeve tee, or even a collard shirt! 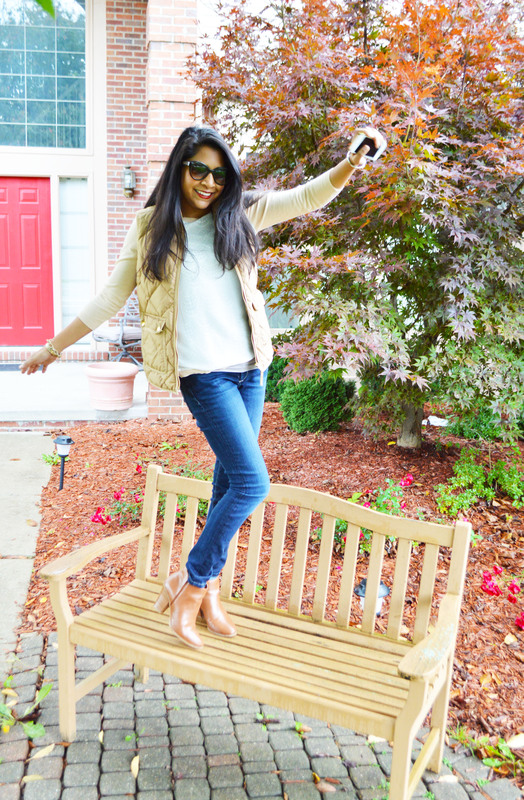 For this look I paired my favorite jeans with a checked top from Banana Republic, heels, and a few gold accessories. If you follow me on Instagram you probably know that my hubby and I are in Hawaii! This is the first trip we have taken alone since having the baby! We miss baby Zara dearly, but its nice to have a few days of relaxation time. Not to mention, Zara is having a blast with her grandparents! 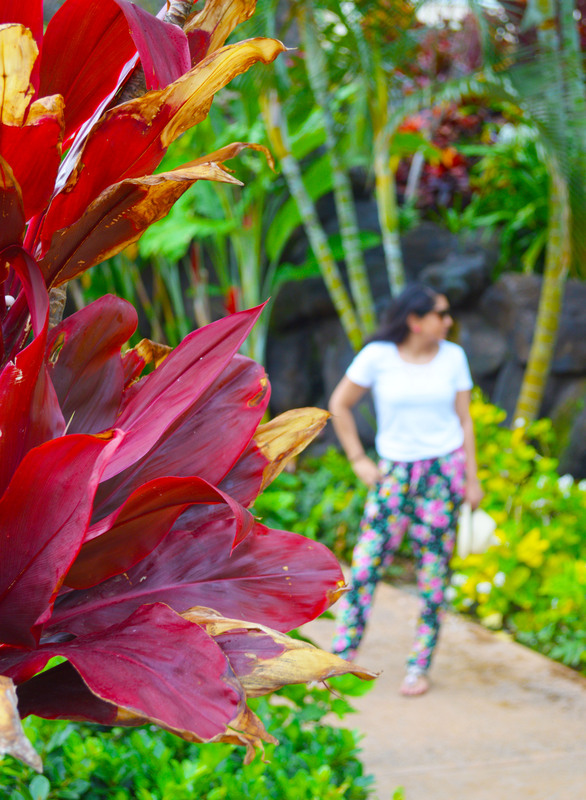 I call this style “the laid back islander.” I wore this outfit the first morning here for breakfast oceanside. 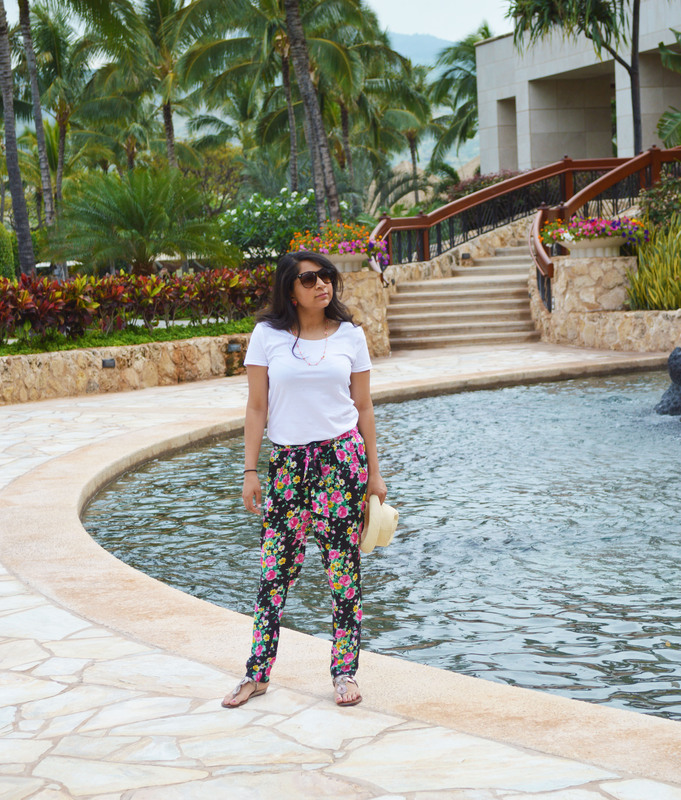 I think slouchy printed pants are a perfect casual addition to any wardrobe. I usually pair them with a plain tee, a few popping accessories, and pretty sandals. It is a casual look without forgoing fashion!